Our pictures directories are some of the largest sections of our site. Next to backyards, front yard pictures is one of the most visited directories. And while this has been very helpful to a lot of folks to get ideas for their own yard and landscaping, there are also several other directories of design details and methods that are very helpful but often missed. Besides all the front yard designs, plans, and pictures in the directory, there are also several directories of specific details such as planting ideas, sidewalks, and driveways that aren’t detailed in these categories. More than simply looking at at the design as a whole, there are often a lot of questions regarding the details of each design such as walkways, driveways, etc. So we need to make those easy to find as well. For the most part, these are the most common details and specific projects that may be needed to create your design. And while you may be able to skim through these pictures and put a beautiful design together, you still might want to take a look at principles of front yard landscape design for structural principles that you may not have even considered. For large areas with possibly too much lawn, try placing an island planting bed or two in the front yard. It will cut down on the amount of lawn used, take up some space, and add some unique shape to the lawn. All Season Interest and Color – Use plants with different bloom times within a framework of evergreen or semi-evergreen shrubs and plants. Do a little research. There are many plants that do well in extreme climates and even bloom in the Winter. 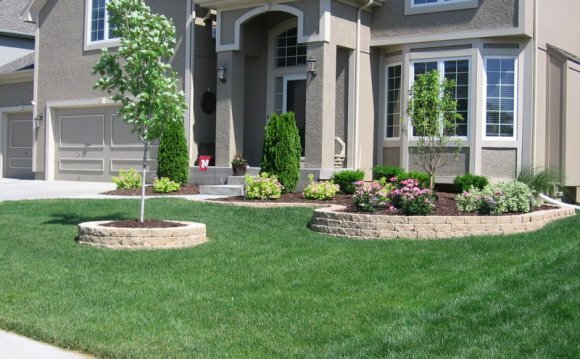 This will help create curb appeal and interest in the front yard all year long. Landscape lighting is often an overlooked afterthought that should be used in most landscapes and yards. Besides the safety factor they create, it also creates a sense of elegance and invitation. While this list of pictures does not cover every individual need or aspect of landscaping a front yard, it does take a lot of the most common and basic design needs and details into consideration. If not in this list, just spend a little time on the site and you’re sure to find all the right information that you need.